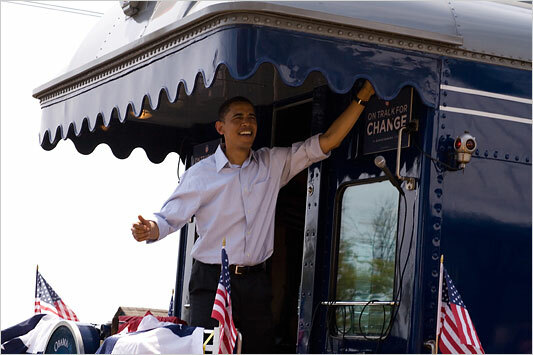 WYNNEWOOD, Pa. – With a pull of the train’s whistle, Senator Barack Obama boarded his car today at Philadelphia’s 30th Street Station and opened a four-city rail tour, arriving at his first stop here to hundreds of cheering supporters. As he stepped off the back of a blue Georgia 300 Club Car, festooned with red, white and blue bunting, the crowd erupted in applause. Strains of Bruce Springsteen’s “The Rising” filled the air as Mr. Obama made his way to a stage built alongside the tracks.